2nd. Love your new header. You're funny and looking hot-like you're new header-hope to see you soon. Greetings with heart&soul from Sil. OK this time I can actually say "I've Been THERE!" and be right -- not like when I screwed up the St. Johns. 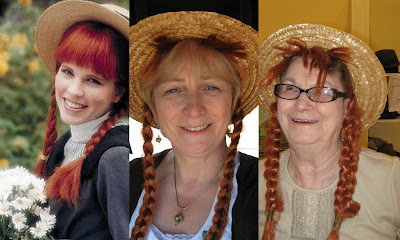 I dragged my DH and my youngest son to PEI a few years back and we did all the LM Montgomery junk. We stayed in a hotel just across the golf course from Green Gables and walked in the Haunted Wood and Lovers Lane at Dusk. Love the great Header, too. Love Anne of Green Gables! Lots of wonderful quotes. I am trying to get my grandgirls to fall in love with Anne like I did. I scour the thrift shops for copies of the books. Mine has long since gone.......I was ten and had a fistful of money earned during the summer doing odd jobs for neighbours. I got on a bus by myself and went into the big town (nobody knew where I was and I was definately not allowed to go into town by myself). There i was a red headed, freckled face kid with no idea where she was going until I stood in front of a row of books and there was my heroine staring back at me. I used up all my money on that book and had to walk two miles home and got a severe telling off and grounding but it was worth it. I had that book till i was into my thirties and gave it to a friends daughter. Thanks for sending me on a trip down memory lane. The new look is great. Looking forward to hearing more about your adventures in beautiful PEI. I'LL BE BACK, JUST FOUND YOUR BLOG TODAY. LAUGHER CRACKS MY FACE. Priceless picture of your mom!